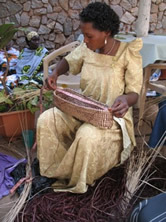 Women from Uganda use raffia to create their overlay on coils woven baskets. Overlay work on the coil is double work for a skilled artisan who first weaves one layer and then follows over that plain colour layer with the design. This overlay work does not hide the coils like in other overlay work. These baskets are made from banana leaf stems and dyed raffia. Raffia can be dyed into almost any colour so many of the designs in this catalogue can be altered and updated to match the most up to date trends in home decoration. These baskets can be made in any size. See raffia baskets. This technique was first conceived in 2006 by one of our volunteers.